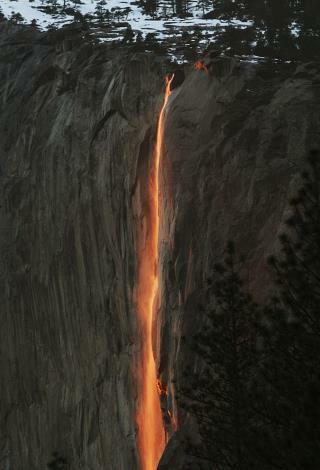 (Newser) – Mother Nature is again putting on a show at California's Yosemite National Park, where every February the setting sun draws a narrow sliver of light on a waterfall to make it glow like a cascade of molten lava, the AP reports. The phenomenon known as "firefall" draws scores of photographers to a spot near Horsetail Fall, which flows down the granite face of the park's famed rock formation, El Capitan. It's also a global warming lesson to the deniers. That glacier that formed the falls melted as long as 20,000 years ago on the same warming cycle we are on now as it reaches the peak of heating levels. Huell Howser did a show about that. In the 40s or so, the park service would pour coals over to recreate the falls. Despite all the negativity out there, things like this are a reminder of how incredible this existence is.